Well, I don't have $1000.00 -$2000.00 to drop on a new bed for Abby, but I have been searching around on craigslist and searching Google shopping. I found a couple on craigslist that were reasonable, but they are always sold or someone e-mailed before me. The cheapest I found on Google shopping is $410.00. That is reasonable to me, but I don't think it would fly with my hubby. Do any of your kids have bunk beds? How do they/you like them? 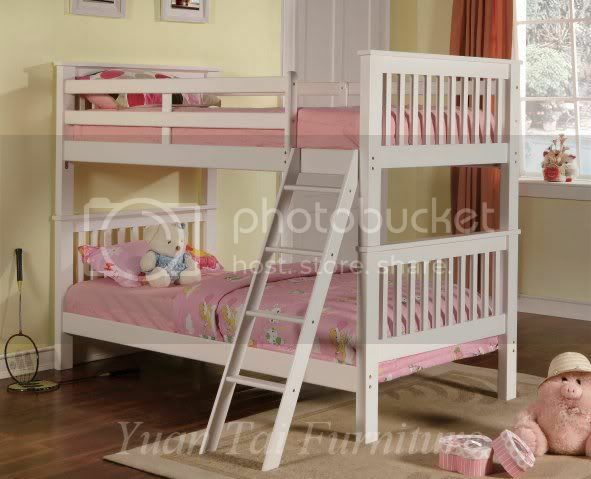 Does anyone have a loft bed that they got for a good price? I really want to see if I can just help my dad make one, he is quite the handy man, but I am sure it would take a lot of work. Has anyone had one custom made?! I had bunk beds when I was little (long before I had siblings). I slept on the top bunk and my parents put a piece of plywood on the bottom bunk for a place for me to play and keep my My Little Pony things up off the floor. I'm sure it could have been fancier, but I never noticed. I know what you mean on the price of loft beds! I was looking for something like that for in Sam's TINY room, but gave up when I saw the price. We got Alex bunk beds and I love love love them! I love her room! I will have to take pictures and post it! I got them for a very good price. 400 for a twin over full, that doesnt include the mattresses but if you do what Carrie said then you only have to buy a twin! Great idea! I love bunk beds! I don't have them for my girls, but definitely wish that I did! I bet if you keep searching Craigslist each day, SOMETHING will pop up. Good luck! I LOVE LOVE LOVE my blog thank you so much! I love that first bed! Absolutely adorable. I had a custom-made bed as a child...made by my dad! The bed was on the bottom, behind closed doors with little windows. He put a light inside for me. There was a ladder to get the to top half, which was a closet, play space. I loved that bed so much...I think you should get your dad to make Abby one! 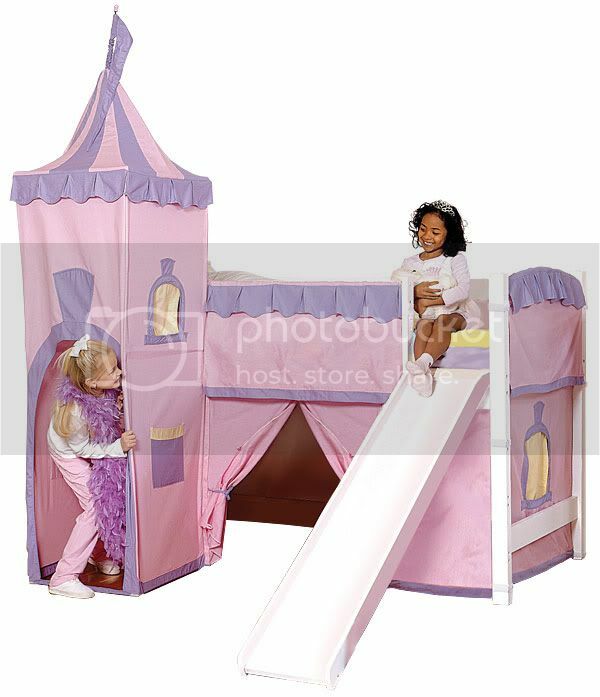 That princess bed is too cute! My boys have bunk beds, but they are aren't 'bunked' right now. I got a pretty good set at Walmart for a little over $100, and then painted them white! You could always start with a set like that and then add on to them. My brothers had bunk beds and we all loved them. The kids would like them and I'm pretty sure my parents didn't have a problem with them either. They had the bunk beds that could convert to two twins if you wanted to unstack them.